Approximately 130,000 of people diagnosed with cancer in the United States each year are in their reproductive years and 1,000,000 cancer survivors are diagnosed during their reproductive years. Whether you’re a newly diagnosed cancer patient, a survivor, or loved one of someone suffering from infertility, this book offers help. 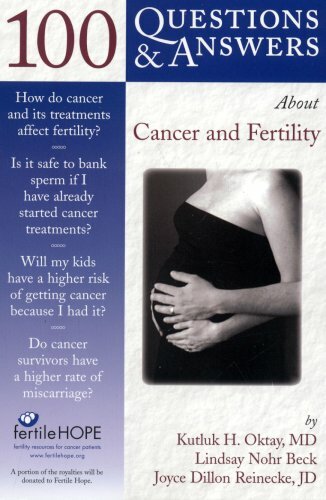 The only text available to provide both the doctor’s and patient’s views, 100 Questions & Answers About Cancer & Fertility, provides practical, authoritative answers to 100 of the most common questions asked by cancer patients and survivors about fertility. Written by an ObGyn/reproductive medicine specialist and cancer/fertility patient advocate, with commentary from actual patients, this is an invaluable resource for anyone struggling with the medical, physical, and emotional turmoil of cancer and infertility.